You've come to the right place if you're looking for a boot disc to get that old HP computer going, a utility to get your computer to speak to that "new" peripheral, or just want to play some old games on a classic machine. The museum has an extensive collection of software that runs on old HP computers. The original source software resides on a variety of media including punched tape and cards, magnetic cards and tape, floppy discs and hard discs. Where possible, the museum archives programs to keep a permanent record of this classic software. Where copyright restrictions permit, this software is available for download. None of the software on this site is currently available from the original publisher, the original publisher’s authorized agent, or from a commercial entity that purchased the original publisher or the rights to the software. None of the software archived by the museum has been commercially available in the last fifteen years. No software titles have been posted without the permission of the vendor, with the exception of items where the vendor is non-contactable. If you find a software title on this site that shouldn't be here, please contact us. Any copyright material posted in error will be removed immediately. Our software archives have come from hard discs, floppy discs, magnetic tapes and CDs. CDs are the easiest to archive (simply by creating ISO images of the CDs). Magnetic tapes and hard discs have been archived using Ansgar Kuekes' clever hpdir utility. This utility requires a PC with a GPIB card. 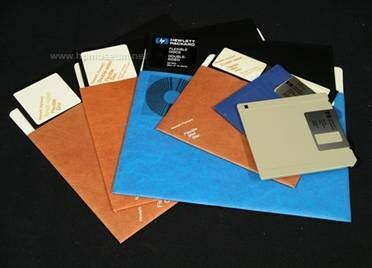 Many of our 8-inch floppy disc originals have also been archived with the hpdir utility. Please visit Ansgar's site to learn how to use the hpdir and hpdrive utilities. Install Teledisk on the hard disc of the computer that you will use to re-create the software (version 2.11 to re-create 5.25 inch discs, version 2.16 to re-create 3.5 inch discs). You will need an old DOS PC with a 5.25 inch floppy drive to re-create 5.25 inch discs. Teledisk works best on 486 and 386 computers. If your web-connected PC has a 3.5 inch floppy disc, you probably won't be able to re-create 3.5-inch originals directly on it because Teledisk does not work under Windows. Download the archived TD0 (Teledisk format) file or zip file to your web-connected hard disc. If the downloaded file was a zip file, then unzip it. Move the downloaded/unzipped file(s) to the hard disc of the computer that you will use to re-create the original disc (typically, this is your old DOS PC). Insert a floppy disc into the drive bay onto which you will re-create the downloaded software. Any data on this disc will be overwritten. The disc need not be blank or formatted. However, it must be the same size and density as the disc from which the archive was made. See below for information on floppy disc compatibility. Run the Teledisk utility on the downloaded file to recreate a copy of the archived software onto a floppy disc. Your new floppy disc will now be readable by you old HP computer. As time marches on, it becomes harder to work with old software on new PCs. This is especially true if you are working with old media (3.5" and 5.25" floppy discs). The best PC configuration for working with old software consists of a Pentium II computer with 128 KB or 256 KB of RAM, running Windows 98SE (Second edition). This computer has both ISA and PCI expansion slots as well as 3.5" and 5.25" floppy drives, and USB ports. PCs made in the middle to late 1990s are the best at fitting this profile (although you will usually have to add a 5.25" floppy disc). By running Windows 98, you will be able to use relatively "modern" optical drives (CD writer) as well as USB peripherals including memory sticks. A PC with Windows 98 will also boot in DOS mode, enabling you to use utiltiies that only work in DOS, not Windows (like Teledisk). Windows 98SE was the last version of Windows that offered a true DOS mode. In order to use a 5.25" floppy disk, the BIOS of the PC must be configured for it (not all PCs made in the late 1990s were configured this way). Access the BIOS settings of your PC at the time of initial boot up (by pressing the F2 key or whatever key the machine indicates). When working with old HP software and computers, it is also very handy to have an HP-IB card in your PC (either ISA or PCI will do). The old disc drives will only be able to read discs for which they are rated (or discs of a lower capacity). For example, the 9121 disc drive can only read 3.5 inch SS/DD discs. The 9122 disc drive can read both 3.5 inch SS/DD and DS/DD discs (but only the 9122C can read HD discs). The 3.5 inch disc drives in most Vectra PCs can read all three disc formats. It is still relatively easy to source DS/DD discs and HD discs in both 3.5 inch and 5.25 inch dimensions. The HD discs are available from some office supplies stores. The DS/DD discs are available daily on eBay and other sites. It is very difficult to source SS/DD discs in either size. Fortunately, this is not a problem. Teledisk will not write to SS/DD discs. You must use DS/DD discs to re-create SS/DD originals. During the re-creation process, the computer only writes to one side of the DS/DD disc, and this is the same side that will be read by SS/DD disc drives (like the 9121). The discs onto which the software will be recreated do not need to be new. Second hand discs will work provided they are not defective. Most of the archived software has been tested to confirm that it can be re-created. In approximately twenty percent to thirty percent of cases, an error message will be displayed when re-creating a disc. If this happens, just “continue” until the process is complete (or until you get a “Drive Not Ready” message). At this stage the re-creation process is complete, and your disc is ready for use. You may be wondering "What is with these crazy TDO files? Is there an easy way to convert them to binary images?" Well, thanks to Ansgar Kueckes, there is a way. To do this job, use his Ima2hpi conversion utility. This utility will enable you to convert 95% of the TDO files on this site to usable images with his HPDir and HPdrive utilities.